RESQ Charitable Trust - Puppy stuck in underground pipe for 8 days! Rescuing animals is tough. Sometimes, rescue operations don’t end happily. There are times when you feel like you’ve hit a dead end, and there’s no way forward. We felt like this for a while, during one of our recent rescues. For a while, we felt like this story would have an upsetting end, but this isn’t a story like that. This one is a story of hope and of determination. A story that proves that when people get together for a cause, they can make anything possible! We received a call on the 18th of June, about a puppy stuck in an underground storm water drain. The pup had fallen inside five days ago through a man hole which had negligently been left open. She had been running around inside the pipes when a feeder in the area heard her cries. After feeding her for a few days, she alerted a few volunteers who got in touch with the ResQ Team. As soon as we heard about the puppy’s situation, we headed over to begin the rescue with the fire brigade and PMC officials, who turned up extremely enthusiastic to help. After attempting to crawl into the pipe from one end, we discovered that it curved in a few places before the next opening and going in all the way through was impossible for a person. The pup was close enough for us to see her, but she was so scared she wouldn’t come close enough for us to hold. We left that evening after dark, planning action for the next day. Early in the morning on the 19th, we went back, determined to locate the puppy and attempt once again to rescue her. We needed to see where exactly she was inside, and decided to use a Remote Controlled car with a camera on top to record. After calling more than 20 people, we finally found Akshay Phadtare, a RC Car racer who agreed to bring his car to send inside the pipes. A GoPro camera was mounted on top with a torch, in an attempt to find the puppy inside the network of pipes. Despite everyone’s best efforts, the camera was unable to locate the puppy since the main chamber branched off into a number of pipes. It seemed as though the operation had come to a standstill, with no way of rescuing the pup. All of us went back home with heavy hearts and an uneasy conscience. This morning, on the third day of the rescue, volunteers in the area called us, excited to tell us that the puppy had been spotted in the same pipe again! We rushed to the spot and after starting to block each pipe’s opening, managed to isolate the puppy in a straight patch of pipe. Retired Col. Vikram Bakshi arrived along with officers from The Indian Army, who were of immense help. One of the officers crawled through the pipe and finally managed to bring the puppy out from the other end. A rescue operation to save one little puppy stuck inside an underground pipe, was ultimately a success due to the pro activeness and enthusiasm of so many people. 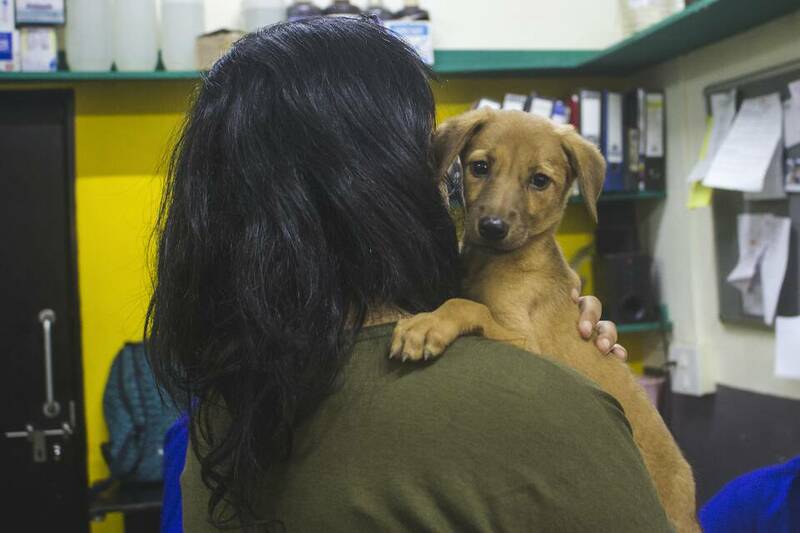 The sincere efforts of the Pune Municipal Commission officers, the Fire Department, Akshay Phadtare, Smita Kher, local animal volunteers, Team ResQ and everyone else who was present to help, helped ensure the puppy’s ultimate safety! The little one is now at recuperating at the ResQ Centre and we have named her Ziddi! Such a fitting name for such a stubborn girl who refused to come out of the drain! Seeing her brought to safety, brought a smile on the faces of so many people…those who were present to help rescue her and those who constantly supported us from wherever they were. Animals have the power to unite hundreds of people, something that constantly amazes us each time we undertake a rescue like this one. We’re incredibly grateful for all the help we get, all the time, from everyone who helps us in tough spots and enables us to continue helping animals. Watch the entire rescue operation below!